D&D 5E has an "advantage" concept where instead of rolling 1d20, you roll 2d20 and take the higher. Likewise, disadvantage means rolling 2d20 and taking the lower. How does this affect the expected average outcome of the roll? Black is d20, orange is highest of 2d20, blue is lowest of 2d20. Since the probability of achieving any given number is a linear function, we can use linear regression (via Wolfram Alpha and our sample data from AnyDice to eventually solve for probability of x = 0.5x - 0.25 - multiply by 100, and there's your percent chance that you'll roll any particular number. 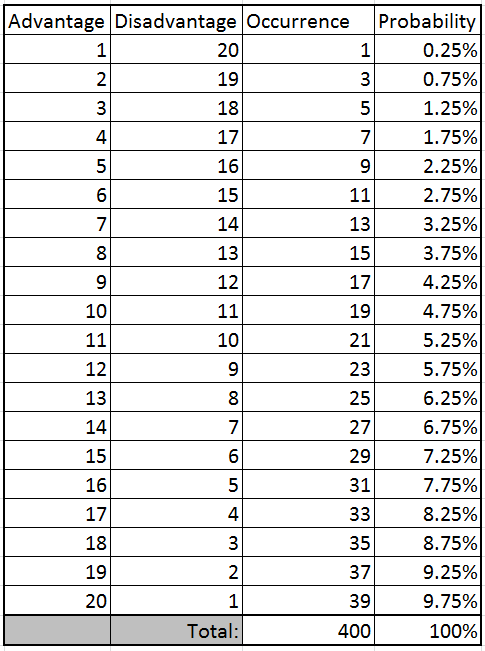 The general rule of thumb that in the mid range of the d20 (from success on a 9+ to 12+) advantage grant roughly a equivalent to a +5 bonus and disadvantage a -5 penalty. The increase and decrease in odds tappers off when your odds of success approach 1 or 20. For example a advantage on a 19+ your chance of failure goes from 90% to 81% not quite a +2 bonus on a d20. A useful application of knowing the odds of rolling two dice is that you can just convert it to a straight bonus when rolling for a large number of NPCs. A bunch of goblins with an advantage from surprise that need 13+ to hit the players you can just apply a +4 (or +5 if you round up) bonus instead of rolling the second dice. This is because they have a 60% chance of failure on 13+. Taking .6 times .6 yields .36 a drop of 24%. Not quite a +5 bonus on a d20 dice. I just wanted to add a more generalized answer to this question that will give you a formula for computing your odd of success with advantage and disadvantage rather than looking up the value in a table. I am going to do my best to make this clear to anyone with any math background, so let me know in the comments if any of the steps don't make sense. So there is a 1.234% chance of this happening (i.e. 1 in 81 stats rolled up will be this low). Since characters have to roll 6 stats per game, the DM decides this isn't actually as unlikely as the player thinks and tells them to keep the stat block. 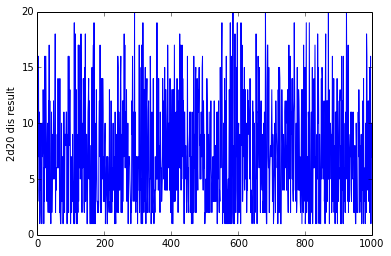 Yes, the two average values sum to 21. Unaddressed is the inherent benefit, or detriment, on the outcome expected rolling 2d20. To minimize duplication of effort, the following analysis assumes the roll is performed with advantage. By definition, rolling with advantage is the act of rolling 2d20, and taking the higher value; the lower die, or one die if they have the same value, is disfavored in comparison to the other. The order in which the dice are rolled is immaterial. Instead, focus on the values they are capable of producing, e.g. of the 400 permutations, there are 39 opportunities to receive a 20 as the favored result. In rolling two dice, benefit for rolling a 1 and a 20, or a 20 and a 1, is still 19. The 1 is the disfavored value, and discounted by the procedure for rolling with advantage. However, it would be a statistical error to assume that one die will always be disfavored and focus on the cases where the value of the other die is greater or equal to the value of the disfavored die. Doing so negates 190 cases where a benefit would still be gained from rolling 2d20 instead of a single die. 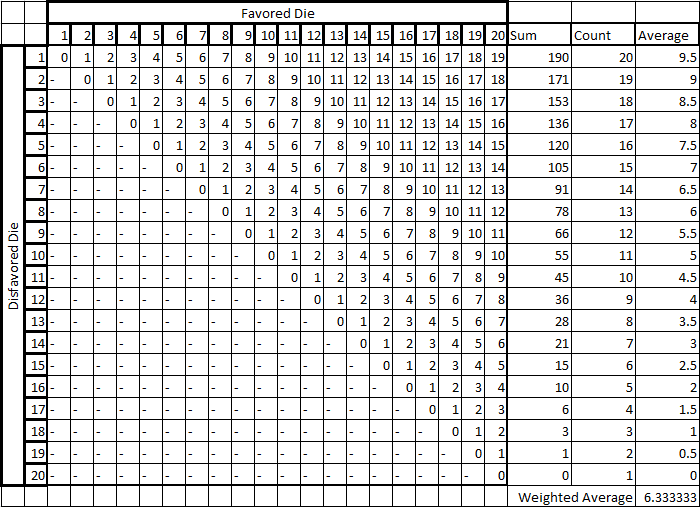 This is because for each result where the die values aren't equal, there are 2 cases in which it can occur. In total, there are 20 cases where the values are equal, 190 where A < B, and 190 where A > B. To correctly analyze the benefit of rolling 2d20, each of the 400 cases must be examined. For each resultant PAIR, the benefit demonstrated by the roll is the absolute difference between the dice, e.g. the values of the two dice are equal, the benefit is zero. Through this, the disfavored value is presumed to be the result we would have gotten in rolling 1 die, while the difference between it and the favored die is the benefit gained. The average of every Benefit is 6.650. To start, I simply rolled a random d20 1000 times. The average 1d20 result for this series was 10. For this graph, I rolled 2d20 1000 times and threw out the lower result. 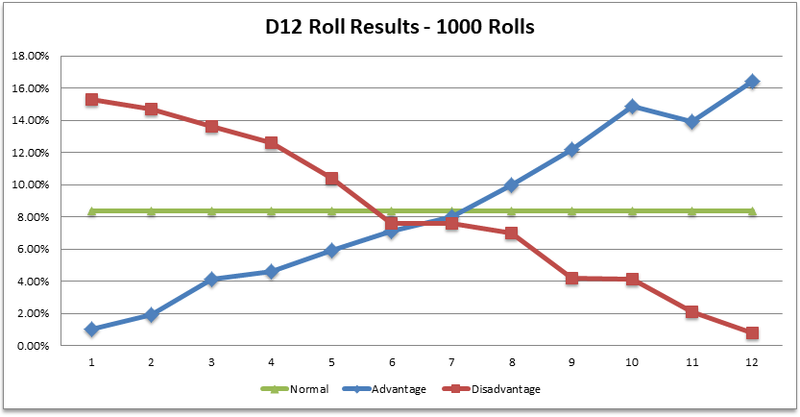 The average result from an advantaged 2d20 roll was 13. 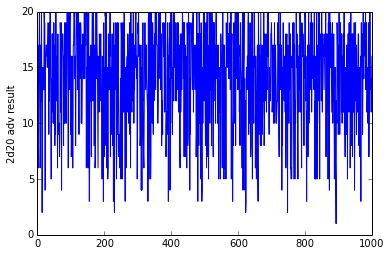 The last graph is a 2d20 1000 times disadvantaged roll. The average result from the disadvantaged roll was 7. So you can see here that there is a general +- 3 bias for advantaged or disadvantaged rolls. This was not intuitive to me at first, so I created an Excel spreadsheet to help me see how it worked with simulated rolls. You can change the number of rolls and change the type of die (d20, d12, d33--knock yourself out), and watch how the rolls change. 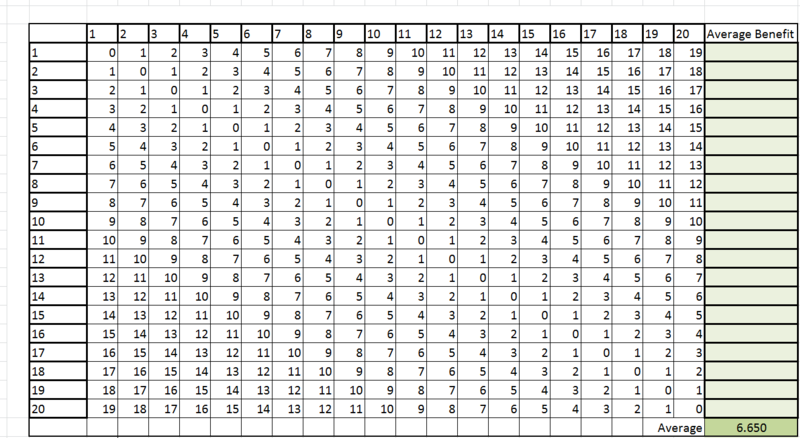 Find the spreadsheet here. Enjoy! The average expected outcome is 1 out of 20. 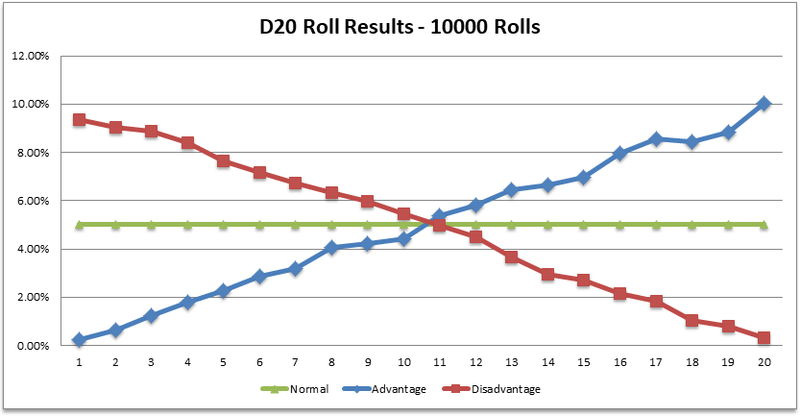 Rolling twice makes the expected outcome as 1 out of 10, which is 2 in 20 simplified, instead of 1 in 20 as with a regular roll. This is the same for both advantage and disadvantage with the difference being taking the lower number instead of the larger number. But otherwise it is the same. Without overcomplicating this I'll keep it short with this example; you have a better chance of find a Willie Wonka golden ticket if you eat 2 bars rather than 1 bar, and the players know this when they roll with advantage or disadvantage. Which is why they like advantage and dont like disadvantage. Hope that helps clear up any confusion, without going scientific on you. Not the answer you're looking for? Browse other questions tagged dnd-5e dice statistics or ask your own question. When rolling with disadvantage what is the chance to get a 1? How should a DM resolve a smooth-talking player with a weak Charisma score PC? How to encourage players to state approach and goal, rather than asking for skill checks? If a secret door is noticed with a DC 10 Wisdom (Perception) roll, don't most characters notice it passively? Does using Sharpshooter really remove Advantage? Do two simultaneous castings of Guidance increase the likelihood of a better outcome? How does replacing Advantage with a flat +2 affect Champion critical hit damage output? How does having monsters of the same type go at the same time affect balance? When do you have neither Advantage nor Disadvantage? How does Halfling Luck (re-rolling my Nat 1's) affect my dice outcome? Do the rules specify that you add your CON bonus to HP when taking the average at leveling up? What is the difference between rolling more dice versus fewer dice?